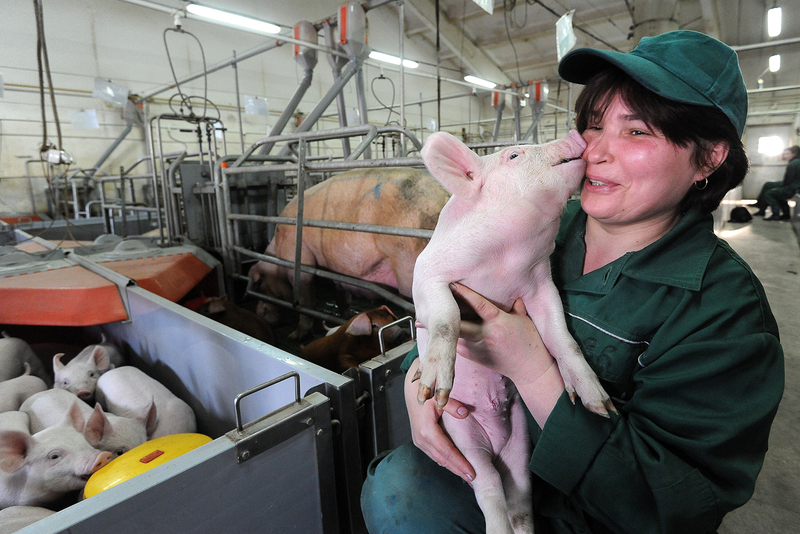 A worker with 1-month old piglet on the Rodnikovsky pig-breeding farm. Russia is looking to step up pork exports to Asia. Despite falling trade figures between Russia and Asian countries, analysts are optimistic about the medium to long term. There is a growth in Russian food exports to the continent, and new logistics projects have been set up to take advantage of trans-shipment opportunities in Eurasia. Russians have also developed a more pragmatic attitude when it comes to doing business with Asian countries. At the end of the 2015, when members of the Russian elite realized, that the country’s so-called 'Asian pivot' was not going to bring immediate investments from Asian, and most preferably Chinese, companies, some experts noted the first traces of success. A year later, Russian businesses are showing more interest towards Asia-Pacific countries, creating an impression that the pivot is underway, despite official Russia-Asia trade statistics not being entirely positive. In 2015, trade turnover with China, Russia’s main partner in Asia, dropped almost 30 percent to $68 billion. According to Bloomberg, Russia has not just become a 'Grain Superpower', exporting more grain, than the U.S. or EU, but is now earning more revenue on food than on exports of fighter jets and tanks. This was largely due to the ruble devaluation that followed the imposition of anti-Russian sanctions by the U.S. and its allies in 2014. Is Germany planning to introduce further sanctions against Russia? What is more interesting, is that Russia now exports food products that it never exported before, and even exports some products that are not consumed in the country. Maxim Basov, Chief Executive of the country’s biggest agricultural company Rusagro, said the company started exporting bottled soybean oil to China in 2015 and corn to Japan and plans to expand its shipments. He added that this year Russia, for the first time, would become a net exporter of soybeans. The main trend in Russian agriculture this year is the export of a diverse range of food products to the Asia-Pacific, where some countries are struggling to find a source of cheap and safe food. The Russian-Chinese Fund of Agriculture Development in the Far East, which invests in companies that export food products, has set an export target of 10 million tons from Russia to Asia by 2020. To make food exports from Russia to Asia more feasible, local and foreign companies are investing heavily. To meet the target of 10 million tons in exports from Russia to Asia, the Russian-Chinese Fund of Agriculture Development in the Far East plans to invest around $10 billion in various projects. According to Yuri Trutnev, Presidential Envoy to the Far Eastern Federal District, 44 of the 270 new projects being launched in the region are agricultural. Investments in these projects is believed to have already exceeded 86 billion rubles ($1.37 billion). Rusagro has started building its biggest cluster, which, apart from soy and corn, will process pork and chicken. Foreign companies have also started investing in food production in Russia, aiming not only to sell products at the local markets, but also for exports. Thailand’s Sutech is building a sugar refinery in the Russian Far East. Another result of the ruble devaluation is a newfound interest among big Russian retailers for logistics projects linking Russia to Asia. Such projects were considered too expensive and even marginal before 2014. What did Putin and Erdogan agree to? According to Alexei Bezborodov, an expert from the InfraNews agency, the ruble devaluation has made routes from Asian countries to the European part of Russia and Europe via the Russian Far East and Kazakhstan as economical as the existing sea route. This year has also witnessed a rise in interest from Asian countries to sign free trade agreements (FTA) with the Moscow-led Eurasian Economic Union (EAEU). The first country to sign one was Vietnam. The agreement, which came into force on Oct.5, gave Russia favorable trading conditions that are on par with what Vietnam offers other major powers, according to EAEU Trade Minister Veronika Nikishina. Anton Tsvetov from the Center for Strategic Research cautions that the agreement itself does not guarantee that Russia and Vietnam will achieve their goal of $10 billon in bilateral trade by 2020, but the very fact that a FTA was signed is important in itself. Talks with South Korea, China, India and Singapore are also underway. A new sector of Russia-Asia cooperation is technology transfer. According to Evgeny Sheyenko from the Skolkovo Foundation, which is regarded as Russia's main development institution for small and medium high-tech businesses, the past two years have witnessed a surge in contacts between Russian and Asian, mostly Chinese, tech companies. “We cannot measure this activity in hard figures - investments or trade turnover - but if you look at the news background, you'll see a drastic change that happened recently. We expect the first major results within the next two years,” Sheyenko told RBTH. According to Oleg Remyga, Head of China Studies at the Skolkovo Moscow School of Management, a large number of Russian companies are still trying to use business models they implemented in Europe and North America, but some companies have started rethinking their approach to deal with Asia. “We are now seeing a very new and interesting period, when companies are finally getting more pragmatic, but we may only see a breakthrough in Asia in around 5 years,” Remyga said.